Fernando Alonso Díaz is a Spanish Formula One racing driver and a two-time World Champion, who is currently racing for Ferrari. On December 19, 2005, Alonso announced that he would be moving to McLaren for 2007. His contract with Renault was set to expire on December 31, 2006. However, on December 15, 2006, Alonso was allowed by Flavio Briatore and the Renault F1 Team to test for one day for McLaren at Jerez, as a result of his successes with Renault. Driving an unbranded MP4-21 and wearing a plain white helmet and overalls, Alonso completed 95 laps. Lewis Hamilton was chosen as his partner for the season. McLaren were reported to be paying Alonso £ 20 million (approx $ 39 million c. 2007) in 2007. Alonso debuted with the new McLaren car on January 15, 2007, in the streets of Valencia. Alonso started the season with a fourth place in Australia, finishing half a minute behind race-winner Sebastian Vettel. He followed that up with sixth and seventh places in Malaysia and China, being outperformed by team-mate Massa in both races. He took his first podium of the season with third at the Turkish Grand Prix, having run second for a time and was only passed by Mark Webber on lap 51 of 58. Prior to his home race in Spain, he extended his contract with Ferrari for a further four years, until the end of 2016. Alonsomanía is the fan phenomenon about Alonso. In 2005 his success fuelled an increase in interest in Formula One in Spain. On September 25, 2005, a huge party began in Alonso's home town of Oviedo when he became the country's first Formula One World Champion and the youngest in the sport's history at the time. Alonso's fans are recognized by the light blue and yellow Asturias flags which are coincidentally the same colors used by the Mild Seven Renault team between 2002 and 2006. After his championship win, a widely-visited exhibition of Alonso's racing gear was held in Oviedo. 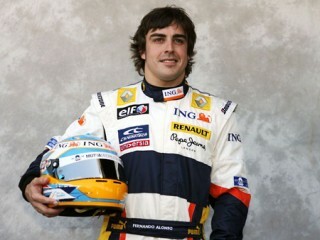 View the full website biography of Fernando Alonso.